Intermediate Phases: Sources with very deep modulation depth (on-off contrast) create the greatest strobe effect, and will generate the strongest color bands and effects. Some will produce vibrant changes that move around and shift in color dramatically, creating intense rainbows. However, even if a source does flicker, the difference between its highs and lows may not be as pronounced, or the frequency of the flicker may be higher. This reduced modulation depth or increased frequency will create more subtle color effects, narrower bands, and blurrier wagon wheel movements from the dark bands. This can range from very subtle, to more intense. Some will generate a gray tone similar to a non-flickering source, but with a very very subtle rainbow effect just visible in the pattern area, to very slim edges visible at the margins of the dark wagon spokes. In other words, the less distinct the patterns are, and the less intense the colors are, the lower the visible flicker is. This is often the case in spaces with mixed sources, like daylight and flickering fluorescent sources. If you detect this, you can walk around the space and test individual sources until you find the one producing the flicker, and those that are not contributing. Note: The human eye does not move smoothly, so if you don’t keep your focus and allow your eyes to move, you may notice a brief flash of RGB color – this will occur under either non-flickering or flickering sources alike, and is minimal, so should be ignored. Available for on-line purchase: The Flicker Indicator Machine is available at the Lumenique Product Center. The magnetic fluorescent lamp created a storm of research on the topic of flicker. People saw it, felt it, and were not happy about it. Claims of headache, migraines, eye-strain, dry eyes, digestive discomfort, poor visual performance, and other maladies were all blamed on flicker. The complaints were so prevalent that Universities, lighting societies, standards commissions, and governments have spent millions studying it, and digging into the topic of light flicker or modulation. This work may not have resulted in hard rules about flicker, but it has consistently found that there is a significant population bothered by it, and that flicker does indeed cause negative effects that cannot be simply dismissed. Under 75Hz is considered a dangerous zone, capable of inducing seizures in some individuals. In the range of 100Hz to 300Hz, individual sensitivity ranges from very low to very high, proven by a large body of work. While it is often stated that frequencies over 100Hz are not dangerous to human health, researchers are widely split on this. Research has shown that flicker, even when not noticeable, reduces visual performance. Several tests have shown that visual acuity and task performance is significantly improved when flicker is either raised to higher frequencies (over 2kHz), or is of very low modulation depth, while performance at <120Hz is poorer. There are medical studies showing that portions of the human brain react and sync to flicker frequencies as high as 300Hz, with as of yet unknown consequences. When operating machinery, any flicker acts like a strobe, creating dangerous conditions that can produce false impressions of speed (or stopped motion) that should be avoided. That all said, setting aside issues of human health that have not yet been firmly established (frequencies over 100Hz), I suggest that flicker does impact visual performance, visual comfort, and immediate feeling of wellness. For some, the impact may be promarily performance based, while others may find flicker to be of greater impact, such as headache and eyestrain. My take: I personally focus on visual performance issues over all else, as the rest of the flicker discussion jury is still out (except for the issues of low frequency<75Hz health problems that are well established.) The Flicker Indicator Machine will indicate when there is flicker in the room that is within the perception of the observer, even if the lights don’t appear to be flickering. Most all individuals with normal human vision will see the effects of flicker in this machine, even if the appearance of flicker from room lighting is not as readily apparent. Just because you don’t feel like the lights are flickering to you obviously, does not mean that flicker does not exist, and is not having an impact on your visual performance. If you can see flicker in this device, it is present, is within the perceptible range for the human visual system, and is within the range to have some effect on visual performance. This may also be the cause of eye strain, headache, fatigue, or other non-visual conditions. Ideally, task environments should not have any visually perceptible flicker present. While a bathroom or hallway is not as critical, work areas, spaces where small tasks or reading are done regularly, where accuracy is critical, or where there is any movement in the task field at all, like operating machinery, there should be not flicker. In other words, using the Indicator Machine, the wheel in these environments should be gray, with no appearance of color. wagon spokes, or rainbow effects at all. About SSL: Do not assume that LED products, even those claiming to be DC LED systems, do not flicker. Many of them do. Retrofit lamps are particularly poor in flicker performance, as they have low cost drivers inside that do nothing to stop flicker at all. New fluorescent products often use high frequency ballasts, as do many LED systems (high frequency drivers) which do not generate visible flicker – producing a gray wheel on the Indicator Machine. Low cost LED, AC LED, Line Voltage AC LED, HID, and low end compact fluorescent lamps will all produce flicker, and will be detectable with the Flicker Machine. Theoretically the ideal RPM, steady state, for the wheel would be 600 RPM. 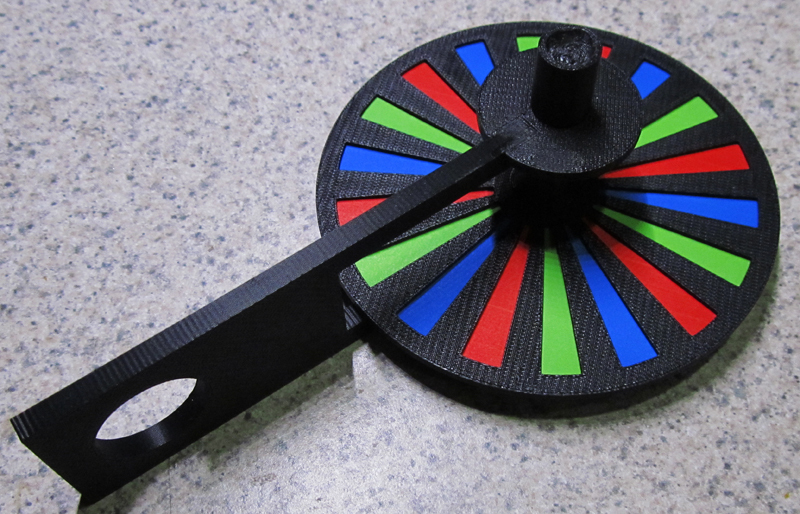 The wheel has 6 segments of RGB, which means 6 repetitions of the color section per rotation. 60Hz is 60 cycles per second, or 3600 cycles per minute. Divided by 6 = 600 RPM. I’ve tested this on a lathe where we set the RPM at 600, and the banding and coloration appears as shown in the images. However, note that a true non-flickering light source won’t show any color bands or spokes at RPMs as low as 85, where the eyes synch rate comes into play. So, a flick of the wheel will reveal all flickering sources as it goes from its highest spin rate, until it slows toward the end when the eye will pick up the patterning even under daylight conditions.